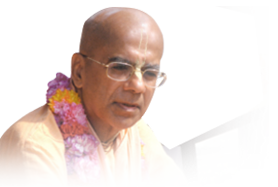 I request all of you and obviously those who come to ISKCON temples are generally devotees who are interested in bhakti-yoga. There is no shortage of places of worship; there is no shortage of temples. We have plenty of temples everywhere. 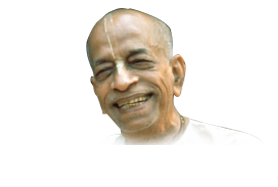 But in ISKCON temples, the environment is such that it promotes the essence of Lord’s teachings which is bhakti-yoga. The conclusion of Bhagavad-gita is devotional service. Devotional service in essence means that we engage our body, mind and senses in the service of Lord and when we engage in the service of the Lord, we get purified. Many times we hear this and we keep saying, “Yes, I will take to the spiritual life tomorrow”. And that tomorrow does not come. Our spiritual master gave us a story. There was once a man in Jagannatha Puri. He would bring water every day to the temple, leave it at the gate and go home. He would say, “Oh! So many people are coming from other places to take darsana. I like Lord Jagannatha. I live here so I can have darsana any time”. He went on postponing this way and one day he died before he could have darsana. So we keep postponing our surrender. Surrendering to the Lord is not bitter, it is sweet. Happiness in goodness is bitter in the beginning and sweet in the end. In the beginning, you have to sacrifice some material thought in favor of finding time to chant; you may have to sacrifice some other activity in favor of finding time to readBhagavad-gita; but spiritual association will give you the strength to develop determination which is the key ingredient to succeed spiritually. So we humbly want to request all of you - the regular devotees and visitors & occasional visitors to please take Krsna consciousness very seriously. This path is open to entire humanity. It is a proven path and it guarantees you full satisfaction if you take on the process seriously. By chanting Hare Krsna, reading Bhagavad-gita, associating with devotees, observing festivals to worship the Lord in any way that you can, worshipping the Deity and by staying where you are, you will be able to perfect your life. This chanting of the holy name is the most important activity. Many times I travel around the world and devotees ask me, “What service can I do?” So I tell everyone that the most wonderful service that you can do is to chant the holy name. When you chant the holy name, it cleanses the heart and frees it from hatred, lamentation etc. and enables you to experience a higher taste. So please take to it very seriously and do not waste a minute. A minute wasted cannot be acquired by the wealth of the whole world. So time is of essence and time and tide as you know, wait for no one. Use every second in the service of Lord and that would guarantee you real happiness.